Talks to us with the tremulous flow of old times. Honor and dignity were proudly defended by Belz." Glorious capital of the principality in the past, nowadays Belz is a small border town of Sokal district, Lviv region, with the population of 2,400 inhabitants. The distance from Belz to Lviv is 70 km, to the border with Poland – 3 km. 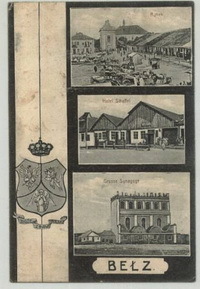 During its long history the town played an important role in geopolitical development of Ukraine. In 1170-1462 Belz was the capital of a separate principality, during 1462-1772 – the centre of the one of seven voivodeships of the-then Ukrainian land. The history of this millenial town is full of interesting and significant events, which influensed the course of European history. It was from Belz, that in 1382 Vladislaus II of Opole took to Częstochowa the thaumaturgic icon of the Blessed Virgin Marry, which became the patron of Poland (known as The Black Madonna of Częstochowa). 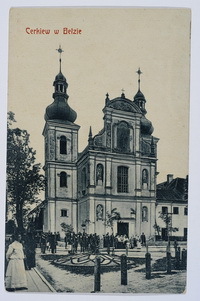 It was in Belz that in 1590 the first council of Ruthenian bishops on the union between Ukrainian Church and Rome was held. In the 19th c. Belz became an important religious centre of jews Hasideans: the Rokeach’s family of rebbes built here a majestic sacral complex with synagogue, school, reconstructed a big Jewish cemetery in suburbs. Historical and cultural heritage of Belz is reflected in numerous sites of history, archeology, architecture, and arts. In Zamochok we can trace the ancient prencely town of the X-XIII cc. ; in the XIV-XVIII cc. the voivode’s castle was located here; in tracts of Klymenshchyna, Monastyryshche and Triytsia there were found vestiges of ancient monasteries. The fragments of powerful seventeenth century fortifications were preserved. The church of St. Paraskeva is one of Ukrainian oldest wooden sacral monuments. Mysterious for everyone seems the hexagonal Tower-chapel. Complexes of Dominicans monasteries of Fathers and Sisters and the chrch of St. Nicolas are valuable as architectural, historical, and artistical sites. Irsze Lews House of praying, Jewish cemetery with several matsevas and mikveh remind about the active life of Belz Jews. In 2001 the State Historical and Cultural Preserve in the town of Belz was created with the aim to research, preserve, and popularize rich spiritual, historical, and cultural heritage of the town. The preserve also includes the church of the Assumption of the Blessed Virgin Marry, built in the town of Uhniv in 1683-1695, and the church of St. Mark of 1688-1693 in the village of Wariazh.